The purpose of this study was to examine the use of industrial sand and commercial salts for mimicking brackish systems in laboratory and greenhouse experiments. Many wetland and freshwater aquatic plants are adversely affected by salt stress and increased salinity concentrations. Sea level rise can increase salinity in aquatic ecosystems and shift vegetation compositions toward more salt-tolerant species. Many studies focus on salt tolerance mechanisms to understand the impacts of wetland salinization and saltwater intrusion. Ideally, natural substrates and seawater should be employed in these experiments to represent the natural environment, but acquiring seawater and field soil is not always feasible, so researchers use proxies to simulate these materials in greenhouse experiments. 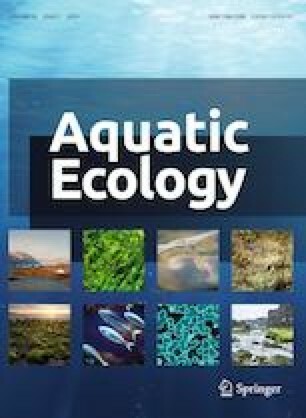 In this study, we evaluated the growth of Vallisneria americana and Hydrilla verticillata under four salinity levels (0.5, 1.0, 2.5 and 5.0 ppt) induced by four salt sources commonly used by researchers (seawater, Instant Ocean Aquarium Mix, laboratory-grade NaCl and Morton Sea Salt). Plants were grown in separate fertilized pots filled with field-collected soil or silica sand and were submersed in 60-L mesocosms filled with pond water. Salinity levels were increased gradually, and water level, salinity and pH were monitored every week. Our results showed that Instant Ocean Aquarium Mix is an appropriate proxy for inducing salinity in mesocosm experiments as its effects on plant biomass were similar to those produced in seawater. Substrate type did not affect the biomass of either plant species, which suggests that sand could be utilized in these types of experiments, provided plants are grown with sufficient fertilization. The online version of this article ( https://doi.org/10.1007/s10452-019-09692-6) contains supplementary material, which is available to authorized users. This research was supported by the Florida Agricultural Experiment Station and by the United States Department of Agriculture National Institute of Food and Agriculture (HATCH projects FLA-FTL-005156 and FLA-FTL-005682). Field-collected plants and soil were obtained under the US Department of the Interior, National Park Service, Big Cypress, Permit # BICY-2017-SCI-0007. Mention of a trademark, proprietary product or vendor does not constitute a guarantee or warranty of the product and does not imply its approval to the exclusion of other products or vendors that also may be suitable. We are indebted to Kyle Thayer, Ian Markovich and Joseph Sigmon for their wonderful assistance in the greenhouse and field. We also thank Hanzhuo Fu for laboratory analysis, James Colee for statistical consultation, Joshua Patterson for providing seawater and Tony Pernas for his invaluable help with field soil collection.